Steven (Chicagoland, United States) on 13 September 2016 in Plant & Nature and Portfolio. Each season, the talented horticulturalists and designers who make up the Bellagio Conservatory team transform this 14,000-square-foot floral playground into a showcase of the distinctive sights and colors of spring, summer, fall and winter—along with a special display for Chinese New Year. When the seasons turn and the displays rotate, 90% of the trees, flowers and plants in the conservatory are recycled, to further celebrate their commitment to the earth. 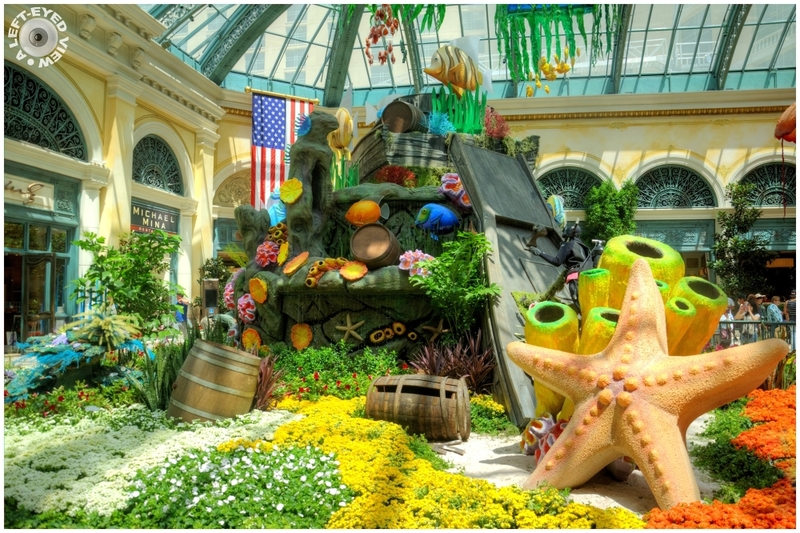 This was part of Bellagio's "Under the Sea" exhibit. Photo captured July 23, 2016. Someone has gone to a lotto trouble to create this colorful display. féliciations pour les horticulteurs Steven.. Superb image. Excellent color. There is so much to see in this fabulous shot. An excellent capture of this marvelous display. I like the designs and rich colors very much. Certainly a feast for the eyes! Nicely captured display! A splendid shot of this lovely display. Great colors and lots to look at. Quelle étoile de mer et décor marin et ces tons superbe. An image full of fantasy ... I like! The light is amazing here. It looks like it should be in some little goldfish aquarium. Where is Dorey when you need her? Where is the treasure? Probably within some of these barrels.